The journal makes a specialist contribution to knowledge related to the educational phases that impact on children from the early years to adulthood. The editorial team of the journal is as follows. Wales is currently in the process of developing a new national curriculum that entails a radical departure from a conventional subject-based approach. 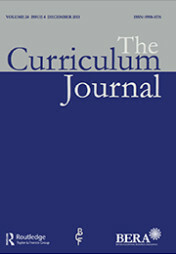 The Curriculum Journal is planning to devote a special issue to this development – which will be of interest not only to readers in Wales and the UK, but to all those interested in the processes and challenges of curriculum reform at the system level. The guest editors, Sally Power and Chris Taylor of Cardiff University, are inviting expressions of interest from authors who would to contribute papers that address the current developments in Wales, on a variety of topics and from a variety of perspectives. Click here for more information. BERA members can read this journal free. Click here to become a member.